If you’ve been trying to figure out how to combine your faith with your finance, you’re going to love this episode! I’ve always been a girl who loves and lives in connection with God. Always. However, I haven’t always let that run free in my business. And if I’m being honest, my growth was stifled by my determination to keep the two separate. The truth is, when I was afraid to let my spiritual nature run free, I never felt authentic. I always felt like I was holding something back and since I’m being honest, I will also share that in doing so, I kept myself from building my business to the next level. In this episode of the Incredible Factor Business Podcast, we explore this statement: Businesses with a spiritual foundation go farther faster. For many entrepreneurs the thought of combining “church and state” presents a real enigma. I have certainly had my fair share of challenges as a result! However, for me, today I say it’s the only way to position yourself to build a business that serves you and shakes the planet. For more than 10 years, I have been working with entrepreneurs and small business owners and by introducing them to key spiritual principles in addition to helping them create business growth strategy, I have noticed not only their results increase but their confidence, their courage and their commitment to doing work that changes the world. If you’ve been wondering how to love God and love making money and you’re tired of allowing other pieces thoughts of spirituality cloud your judgement in moving your business and life forward, I’ve got a treat for you. I’ve literally watched this principle change the lives of thousands of entrepreneurs and produce a freedom most had only prayed about. 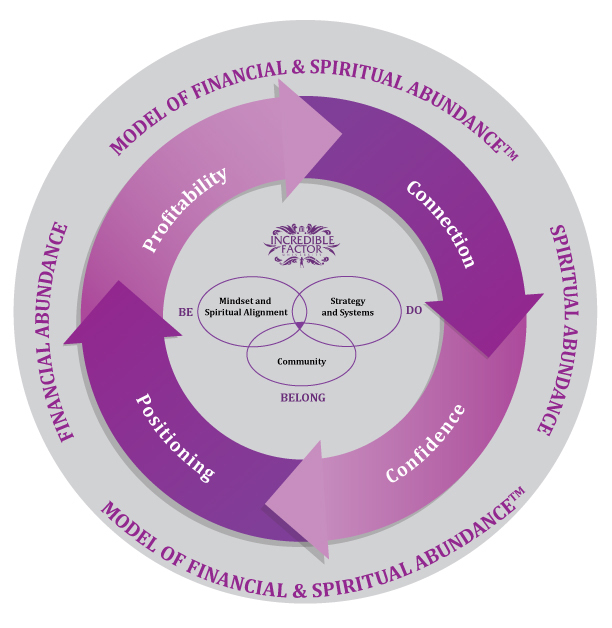 So today, I am introducing you to another key foundational principle, the Model of Financial and Spiritual Abundance™. I did a survey of 200 entrepreneurs and small business owners during a speaking engagement about 6 months ago. What I found as it pertained to spirituality and business might take your breath away. Listen in as I share all about the Model of Financial and Spiritual Abundance and the role it plays in building a business that shakes the planet and funds the life you crave.